Climbing and access information for this peak is found on page 262. 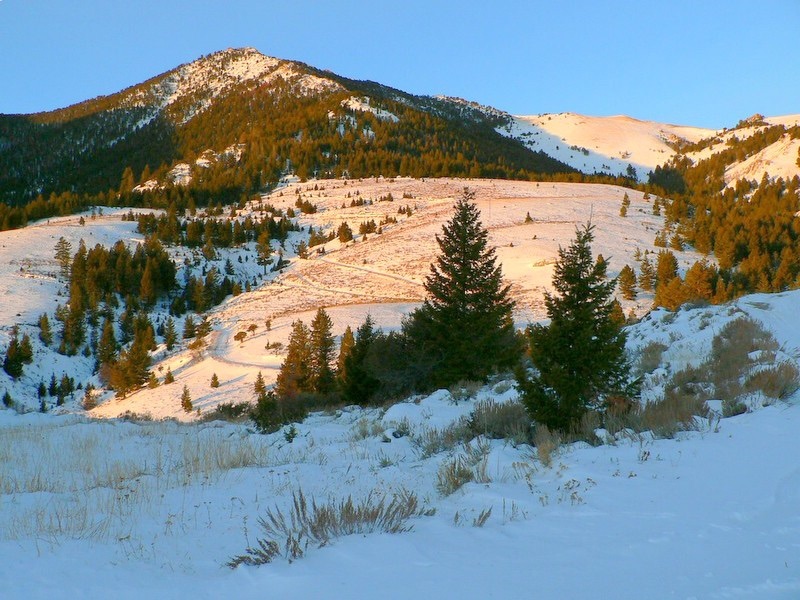 Mackay Peak is the impressive mountain serving as a backdrop to Mackay, Idaho. It is an easy peak to reach thanks to the mining roads that lead high up its slopes. 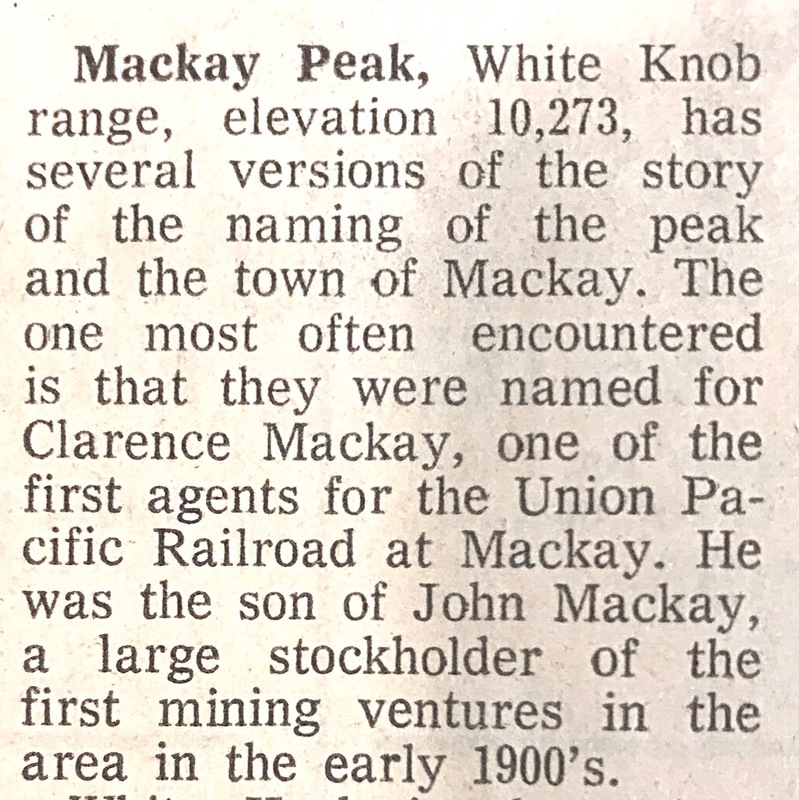 No doubt miners or Native Americans made the first ascent of the peak. This notation was found in An Idaho Statesman article. There was nodate on the clipping. Livingston Douglas made the first recorded ascent of the the peak’s class 3 northeast ridge. Like many Idaho peaks there is some question as to the exact high point. Livingston discusses this issue in his route description, which is found below. From the Junction of Highway 93 and Main Street in Mackay, drive southwest on Main Street. Main Street turns south and becomes Smelter Avenue. At the 0.9 mile point, cross the bridge over the Big Lost River. At 1.8 miles, notice a large sign for “Mackay’s Mine Hill” (this is where the infamous “Mine Tour” begins). The road is now labeled “MK-207.” At 3.5 miles, the road enters the Challis National Forest and becomes FSR-207. At 3.8 miles, there is a road junction. 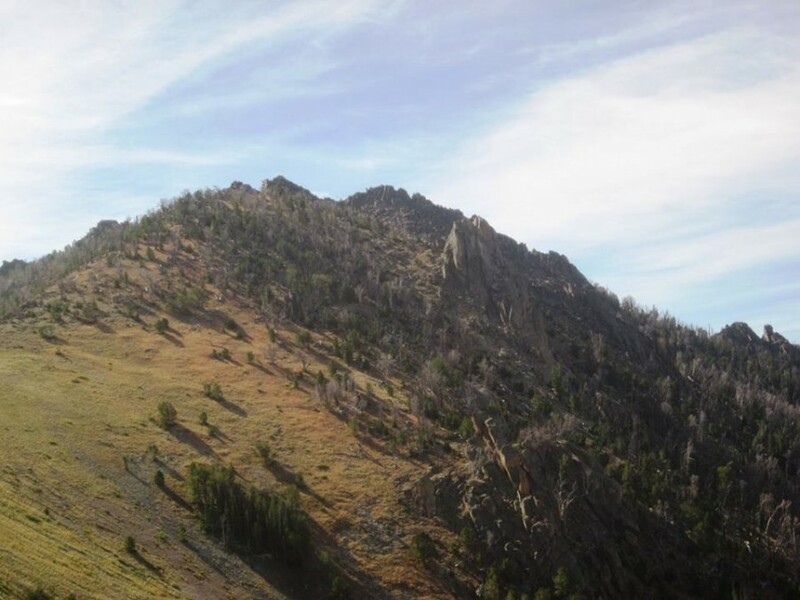 Go straight on FSR-207 if you wish to climb the north ridge of Mackay Peak. Park somewhere among the upper mines alongside the road. If you wish to climb the northeast ridge of Mackay Peak, turn left here onto FSR-207A and drive 0.1 mile to a road junction. Park here (7,300 feet). Thankfully, the road is a good gravel road at least to the 3.8-mile road junction. I climbed this route on 7/14/16. From the parking area, walk back to the main road (FSR-207) and hike west up the road to a three-way junction at 7,680 feet. You are now at the base of the northeast ridge of Mackay Peak. Climb west up the steep, open slope. As you approach the forest, turn left/southwest and climb through the open forest without too much difficulty. As you move higher, the terrain gets somewhat steeper and the forest thicker. You will find yourself in a mix of thick pine bushes, krummholz, and blowdown. At a few points, you’ll break out into the open, only to be hit with a short section of steep, large boulders. This is NOT a fun bushwhack. The ridge itself is rather poorly defined, and you’ll feel more like you’re doing a face climb much of the time. But after 1.5 hours of challenging bushwhacking and boulder hopping/climbing, you’ll reach the base of the summit rocks of Mackay BM. Scramble up the class 3 boulders to reach the [very small] summit. Here, find two USGS benchmarks in the boulders, as well as a smattering of triangulation posts, wires, and even a triangulation tripod in reasonably good condition. If you studied the Mackay Reservoir quadrangle before this climb, then you know the true summit of Mackay Peak is not the Mackay BM, but is a rocky outcrop to the west-northwest of the benchmark. What you may not realize is that the map hides a lot of sins that are embedded in this summit area. It won’t be easy to traverse over to the true summit. Before I began my traverse to the real summit of Mackay Peak, I returned the wooden triangulation tripod to its old glory. I stood it upright, securing its rickety legs with talus, and positioning it directly atop one of the USGS benchmarks. Now it stands tall and proud, honoring the intrepid surveyors who mapped the western mountains and established all of the elevations of peaks and points that we take for granted. And the summit of Mackay BM is now consistent with all of the wonderfully-maintained mining remains one can visit along the Mackay “Mine Tour” Road. The triangulation tripod is probably visible for miles now, rather than being unseen and rotting on the ground. Okay, so much for sentimentality. 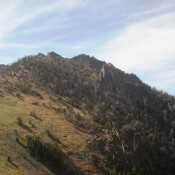 Let’s do the traverse to the true summit of Mackay Peak. Move generally in a west-northwest direction through an open forest that has undulations, large boulders, and short-growth pines thrown in to tangle up your legs. Here are the ups and downs along the way: 80 feet down, 70 feet up, 80 feet down, and 110 feet up. Early on, there is a massive, house-sized boulder that appears to possibly be higher than Mackay BM. So, I scrambled this, just to make sure it wasn’t. And it wasn’t (it was 10 feet lower than Mackay BM), so don’t waste your time climbing it. This will save you a little bit of work, but not much. After weaving around, bashing through short-growth pines, and some ups and downs, you’ll finally reach the more-open area of the true summit. The actual summit is a boulder (surprise, surprise). No signs of human activity here (not even a cairn). But, thankfully, it looks and measures (by altimeter) to be a measly 10 feet higher than Mackay BM. The USGS map confirms that by rewarding the west-northwest summit with a higher contour line than Mackay BM (though the BM is measured at 10,273 feet, just shy of the next contour line). The altimeter and the map concur. Visually, it’s hard to decipher a 10-foot difference from over 0.25 mile away. The traverse from Mackay BM to Mackay Peak took over 20 minutes of tedious scrambling. I doubt that this summit sees many visitors. I suspect that they are riding their ATVs on the “Mine Tour Road” and are only occasionally staring up at the relatively-indistinguishable, forested peak! Use the links below to read Dan Robbins and John Platt’s trip reports for a climb durimg winter conditions.